Choose from hundreds of fashion-fabric colors, patterns and sizes to achieve a distinctive look for your home. Each awning is individually made to order. Delivery and Installation available. Some styles available with optional motors. 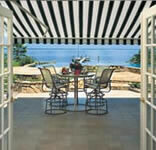 Enjoy your deck or patio more than ever by installing a beautiful, yet practical, retractable awning. Great, come rain or shine. Retractable pool, deck and patio awnings protect you from the hot, bright sun and harmful ultra-violet rays, allowing you to spend more time or your deck or patio. The use of window awnings can cut your utility costs and protect your furniture, drapes, and carpet from sun exposure. Be sure to visit our showroom to see the Sunesta Retractable Awning features available and browse through our catalogs. 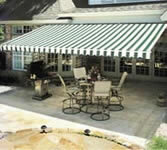 The retractable awnings shown below are just a sample of what we carry. Awnings sales, delivery, and installation throughout Baltimore County, Anne Arundel County, Carroll County, Harford County, Howard County, and Baltimore City. just outside Baltimore City, in Lutherville - Timonium at 1616 York Road. Carroll County, Harford County, Howard County, and Baltimore City.